Mini Modern: Nani Nani Boo Boo! 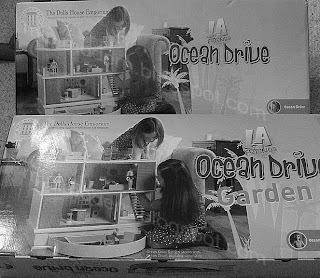 I got an Ocean Drive Dollhouse and Garden. You can't see me but I am sticking my tongue out. This doesn't mean that the dollhouse is now being shipped to the United States. I got some assistance from overseas. Well, I've still got to build the house and put some wood flooring in, etc. but I already know how I want to decorate it for the first phase. Oh, and note that the garden extension looks so much more cool in person than in any photos. Okay, I've rubbed it in enough...but here's one last "Tee Hee Hee"! Be sure to show us some rooms after you had a chance to 'play' with it. I've wanted one of those for a while. Lucky you! Post some pictures after you set it up. I'll definitely post some pics! WOW!!! I can't wait to see the pictures! Ha ha--I am terrible at putting things together. I have enlisted help. Are you really going to race to build yours?? ha ha---that's crazy! I do want to see what you do with yours though. You gotta post pics too when its done.